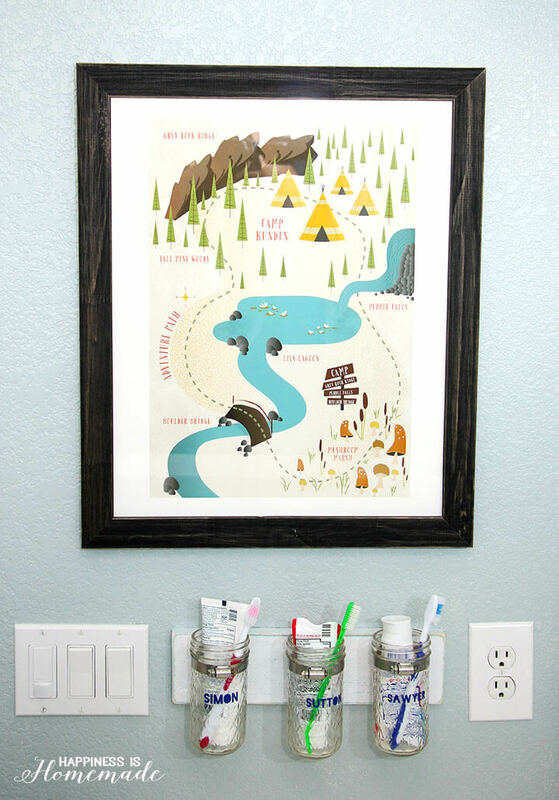 Quick & easy outdoor adventure themed boys bathroom makeover that can be completed in a day or two! Change the entire look of the room with little effort! It seems like my boys are growing up so quickly, and instead of toddlers and preschoolers, I now have 9, 8 and almost-5 year olds on my hands (where did all the time go?!). 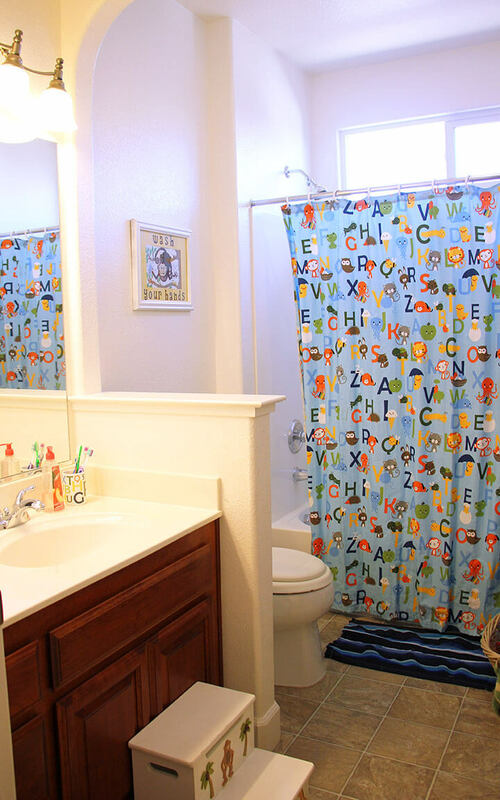 Since they’re older now, the boys have developed strong opinions about the way they think things should look, and they recently voiced their opinion that it was time for their “babyish bathroom” to get a big kid makeover. This is the “babyish” bathroom before. 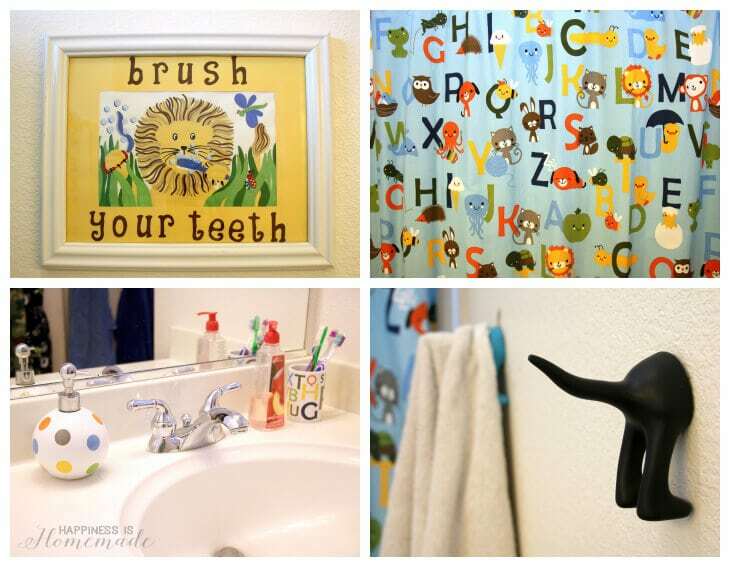 White walls, alphabets and lots of cutesy cartoon animals. I suppose that the boys had a valid point. ABCs aren’t really appropriate for kids who have been reading chapter books for years. The only thing in the room that the boys wanted to keep were the dog towel hooks, because if you’re a little boy, there’s something hysterically funny about dog butts. 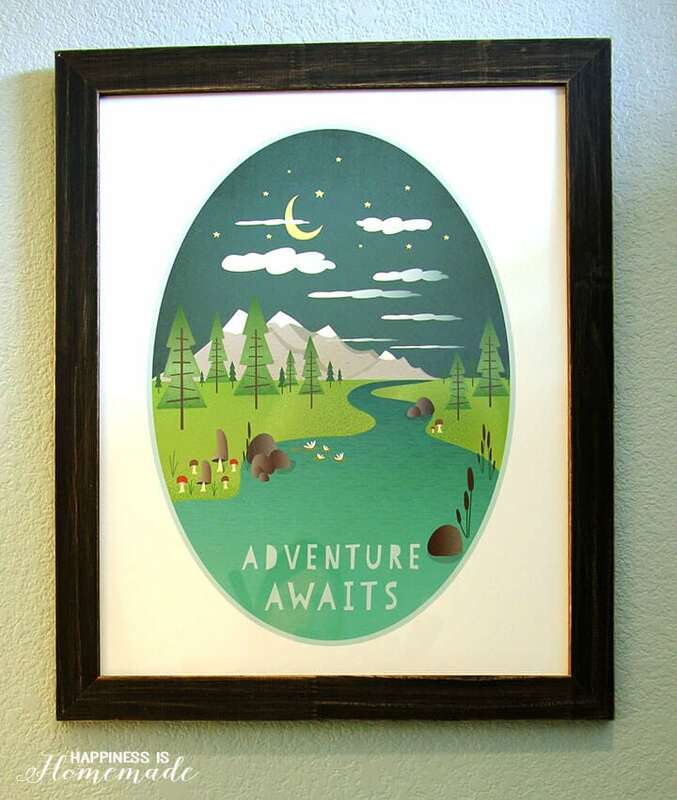 I discovered this Adventure Awaits art print from Minted, and the boys and I decided on an outdoor adventure theme for the new space. Minted has a TON of stylish and modern children’s wall art and nursery art prints available, and many of them are able to be personalized as well. Minted’s artwork is sourced through their community of independent artists through ongoing design competitions, so you can be sure that their design library is full of trendy and popular styles. We decided to decorate the bathroom in two phases to work around time constraints – Phase One to implement the most important design elements (shown today), and Phase Two to add final details and decorative accessories. 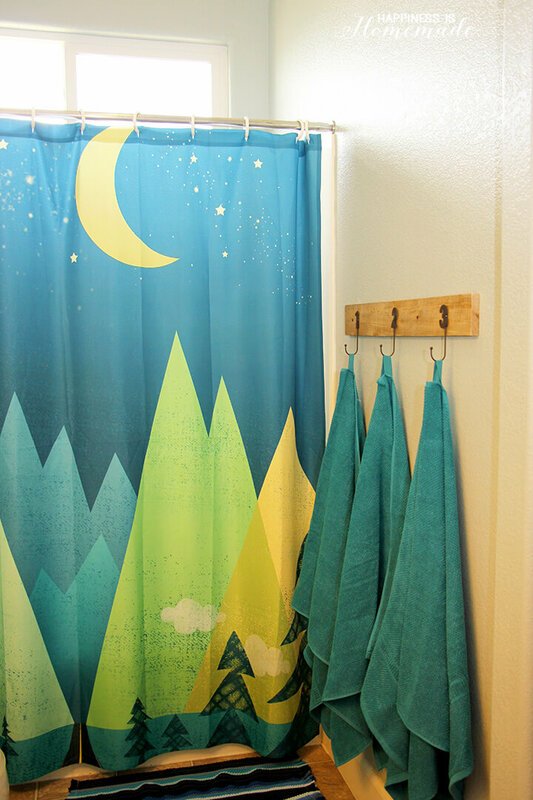 For Phase One of our bathroom makeover, we painted the walls a light blueish grey (a combination of leftover paint cans that we had in our garage) and purchased a starry mountain night shower curtain that coordinates perfectly with the new Minted art work. 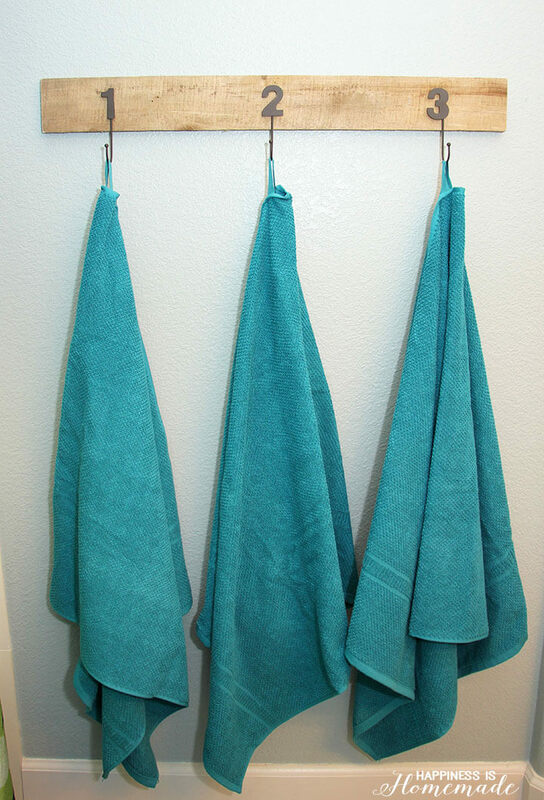 Since the dog tail towel hooks didn’t really go with our new adventure theme, I used a scrap piece of pallet wood and metal number hooks to make a new towel rack for the boys, and I stocked it with fresh turquoise towels from Ikea. 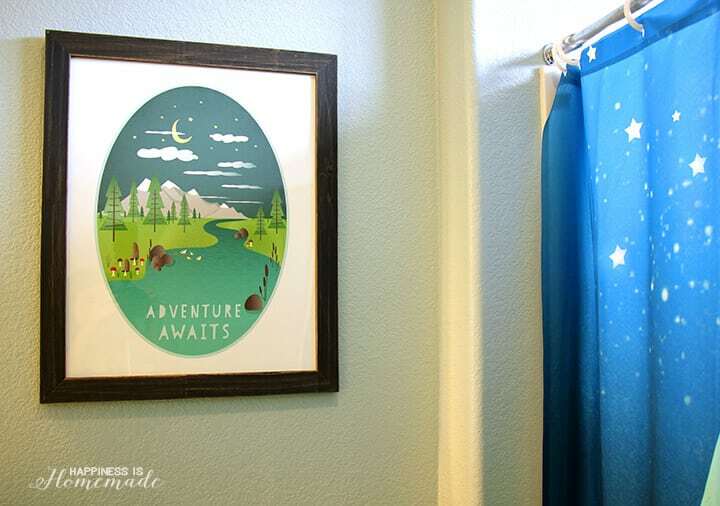 I love the way that the details in the shower curtain work alongside the Adventure Awaits print. They look great next to each other! I reorganized the side wall next to the door and bathroom vanity so that it has better form and function as well. 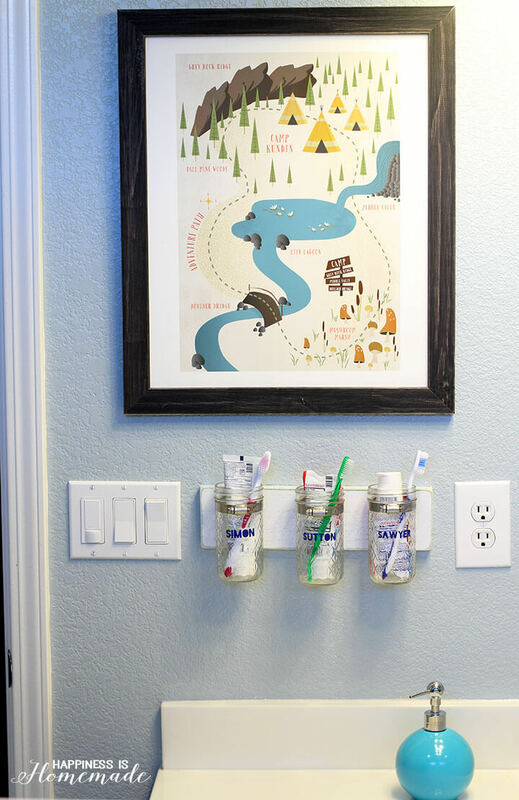 I used another piece of scrap wood, plumbing straps and mason jars to make this quick DIY toothbrush holder for the boys. 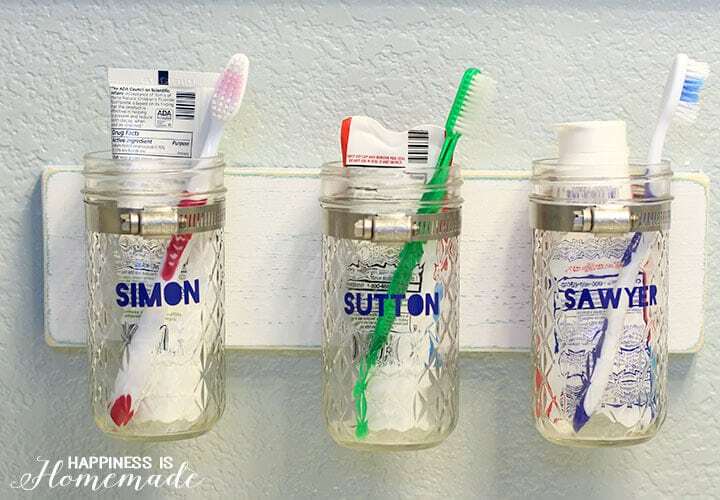 I personalized each jar with vinyl so that everyone’s toothbrush and toothpaste has their very own place. 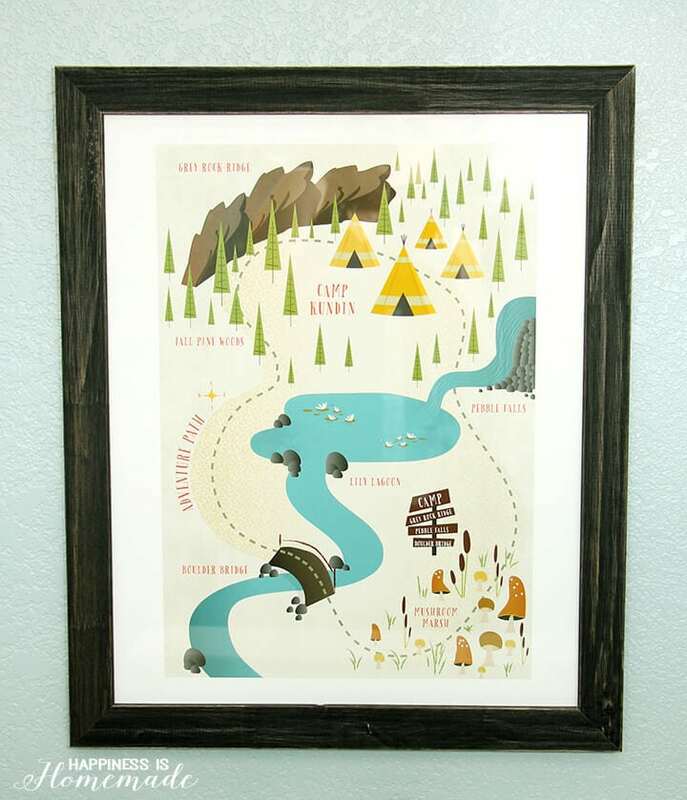 This Adventure Map art print is also from Minted, and it can be customized SO many ways! 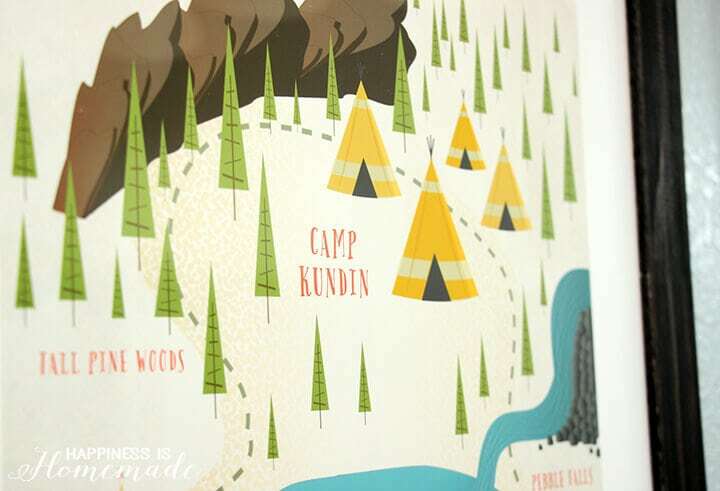 It comes in four different colorways (ours is lemondrop), and you can change the text on ANY of the places on the map. I thought about adding my boys names to the different areas (Sutton Lagoon, Simon Falls, Sawyer Bridge, etc. ), but in the end, I decided just to customize the camp site with our last name. It turned out super cute, and the boys love it! In Phase Two, I’ll be installing a small shelf over the towel rack, and I will be adding final decorative accessories to the space including a painted globe and a vintage camping lantern (as shown in the design mood board at the top of the page). I’ll also be replacing the rug with something larger and more suitable. I’m really happy with the way this space is shaping up, and I can’t wait to show off the finished space after Phase Two is complete! Love the bathroom! 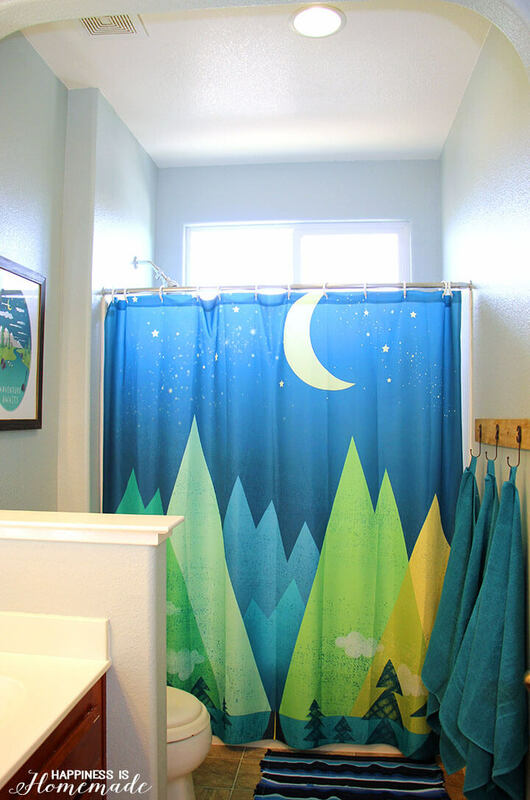 My little boy has decided that, that is th exact shower curtain he and his brother need. Where is it from? Thanks! You can find it on Society 6, Amanda (CLICK HERE!). 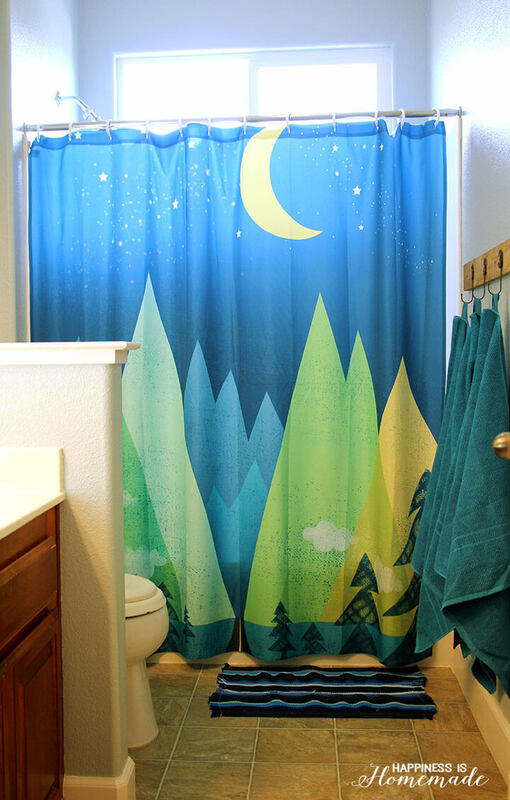 We’ve had our shower curtain up in a sunny location for almost a year now, and it has no fading and still looks brand new (which says a LOT in a bathroom full of boys!). I’m super impressed with the quality! Where did you find the Teal Lantern? It’s so cute!